Westminster City Archives has in its possession probably the most detailed Local Authority bomb map in existence in this country. As part of the development of the West End at War website, the bomb map has now been digitised, making it more available to the public. 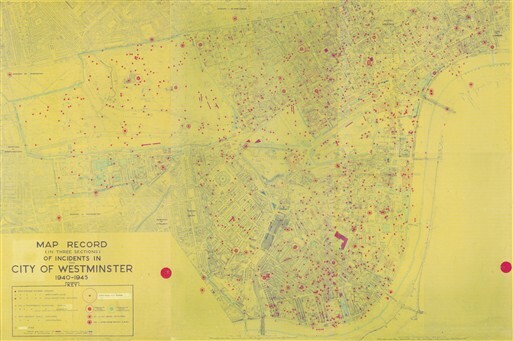 Every single bombing incident which occurred in Westminster during the Second World War, including famous incidents such as the bombing of Buckingham Palace and Guards' Chapel, is marked on the Westminster Bomb Map and cross-referenced to Westminster's complete collection of paper-based records kept by individual Air Raid Warden (ARP) posts across the city during the Second World War. Uniquely, Westminster City Archives not only has detailed reports of each incident located on the map, but photographs of the damage which resulted. No other local archive has such an extensive collection linked to one of the pivotal phases of the war. This page was added by Camilla Bergman on 19/08/2010. Thank you for your query. Unfortunately we don't have a large size print of the bomb map as it is very large and is on 3 x A2 panels. However Westminster Archives do sell A3 prints for £15.00, however, because of the scale of the map you will lose alot of the detail of individual incidents but it is still an amazing map and well worth it. You can also visit Westminster Archives to view the map properly. Please visit http://www.westminster.gov.uk/services/libraries/archives/services/ to find out more information on the digital printing available at Westminster Archives. Thank you for your comment the red circles represent actual exploded bombs. I have now attached a key to the symbols on the bomb map part of the website, which I hope you will find useful. The bomb map and civil defence records are available for the public to see at the Archives Centre which is open to the public Tuesday to Thursday 10am-7pm, Friday and Saturday 10am-5pm. From my birth in 1940 to 1945 I lived on Dyott Street ,in the St. Giles area slightly east of the upper Charing Cross Road Westminister boundary. Is it possible the source for your bomb map data could provide identical information (with photos and official reports) for the adjoining St. Giles Village? Perhaps you have some on file as my home was so close to Westminister you may have overlapping records. What information on this period is available at St. Anns? Further. I discovered a London Metropolitan Archive web site which catalogues Bomb Damage maps like Westminister's. But only viewable at their location not on line . As I live in Florida nowadays it will be some time before I can get to their Clerkenwell address to look for myself. However, I will quiz their information desk with my request. If Carmine has any relevant information to add I 'd appreciate it. 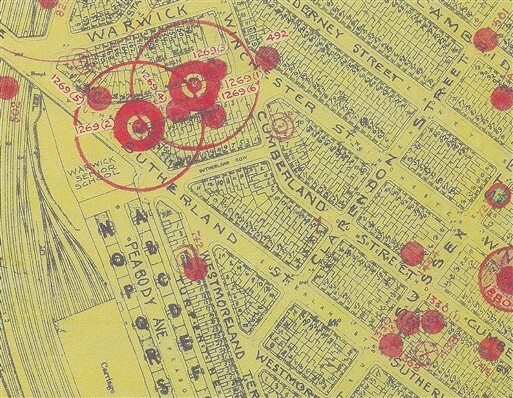 Do you have a bomb damage map for the Marylebone area? Westminster City Archives does not hold a bomb map for the Marylebone area. However we do hold incident reports, which we hope to include on the site. It is important to distinguish between Bomb PLOT Maps - which this is, ie a contemoraneous ARP record, and Bomb DAMAGE Maps which show the extent of damage to buildings, and were compiled after the war. The latter have been published for the whole LCC area by the London Topographical Society. i am trying to locate the address of my grandparents and 2 aunts who were killed in the blitz,i am unable to find any information.all i really know is it was 20-9-1940.close to shoreditch station.any information will be greatly appreciated. I was four years old when the V1 fell on the block between Cumberland Street and Winchester Street, and Sussex Street and Gloucester Street. I remember the day very well. It was just before lunch, my father was working at Metalbox on Buckingham Palace Road and was due home, when the siren went and we went down to the celler (coal), beneath the pavement. After a short while my mother returned to the kitchen to check the meal cooking on the stove, as she returned there was a huge deflagration and the cellar door exploded throwing her inwards with my small brother, who was in her arms. When the 'calm' returned my brother's ear was bleeding and my mother had a huge bruise on her arm where she had been hit by a doorpost or a brick. We made our way out climbing up the steps and over the rubble to Cumberland Street. A neighbour was dead at the top of the steps, she was deaf and according to my mother had not heard the siren. Little was left of the three storey pillared Victorian house : the external walls, but nothing between them but lats of wood from the ceilings. The road was covered with bricks, the gutter was filled with running water with ten shilling and pound notes floating by, seemingly from the shops on Sussex Street. We made our way to Warwick Way. Someway up Cumberland a neighbour invited us into their house, I remember drawing in the dust with my finger on their table. That evening we slept in a shelter near Hyde Park Corner where I remember being given a toy, from a room that looked to me like Alibaba's cavern, I had never seen so many toys in my young life ! We were evacuated to Wales in the days that followed. I have just found this web site and it has so much information.I lived in Warwick Way just after the war. I was born 1945 . My friends and I would play down The Bomdies as we called them . I was about 5 /6 years old. We played down on the site mentioned above by John Kinsella . These bombed sites were like adventure playgrounds . They have all been rebuilt on except the one in Sussex Street which is an Adventure Playground because of a covenant on the land.John Urquhart I think your house is where the Adventure playground is now. I have just come across this site. My Grandfather was and ARP during the war - They lived at 97 Tachbrook Street (now Lilington Gardens) and there post was in St Georges Drive - I have a number of his photos of bomb damage in the area which I have scanned if you are interested. I would be interested in the scanned images of any bomb sites as noted by Stephen Dunn. I lived in St George's Square and walked to St James the Less in the mid-1950's. I would be particularly interested in the site on the corner of Moreton Street and Tachbrook Street, as I am planning to draw a map of the area now lost below the Garden Estate. I was born in Hammersmith Hospital on August 7th, 1944, supposedly during, or shortly before a V-1 crossed over and came down nearby. Cannot tell by the "Bomb Location Map" how far these explosions would have been from the hospital. Can you help me at all? I would like to hear from any body regarding The ARP in the Plimlico area, my grandfather Augustus " GUS " Blundell,was a post warren durring W11 and was awarded the George medal, I still have some of his notes.